In 2003, we successfully applied for the Jerwood Circus Award to create a vertical dance duet, ‘Why’ with choreographer Fin Walker, which was presented at the Royal Opera House’s, Floral Hall, Covent Garden in 2004. On ‘Taking Flight’, we brought together 6 different pieces, (3 live and 3 film) and wherever possible, sited them in varying locations and facings, inviting the audience to move around the work and make choices about their proximity and physical relationship to the work. Fundamental to all of the pieces was a genuine fascination to explore the range of movement, dynamic and suspension gained whilst working at improbable angles, or when the dancers familiar relationship to the floor, weight and gravity was substantially changed. Working with collaborators with whom the AD had already established a strong professional working relationship and physical dialogue grounded us in a strong foundation from which to begin exploring new work and territory. It was quite an ambitious undertaking for a 1st touring production and easier said than done! 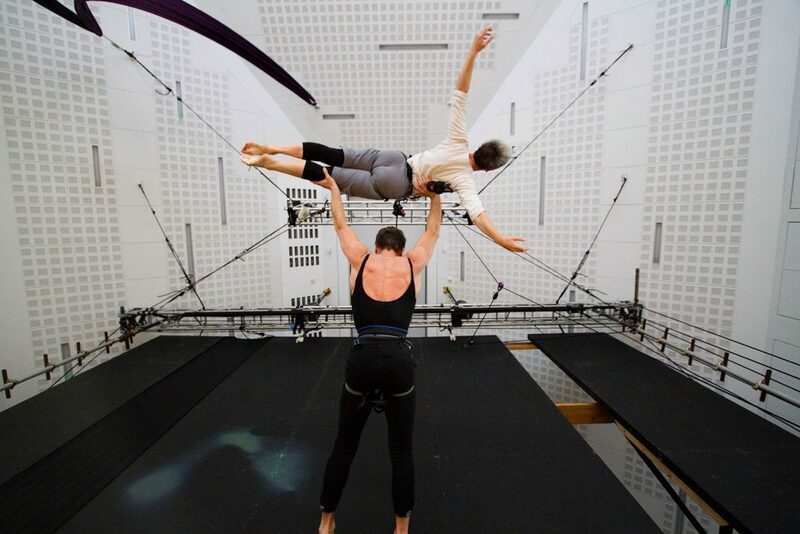 With ‘Shift’, our next touring production (2008), having learnt valuable lessons on ‘Taking Flight’, the initial ambition was to simplify the complex process of making and touring an aerial dance production. We wanted this piece to offer the same shifts in perspective and viewing choice to the audience, but to make it a more intimate experience by siting all the pieces within the same cohesive environment, thus containing it. This production was ‘design led’, with the idea that the set would have its own journey through the performance, influencing and being influenced by the choreography and encouraging an organic co-existence between the pieces, whilst retaining the variety & versatility of a mixed programme. Phew, did I say simplify …. 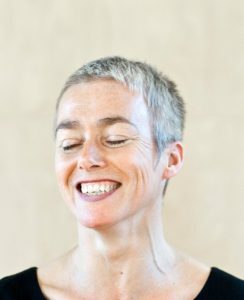 Designer, Mish Weaver, responded to the working title ‘Shifting Planes, Emerging Landscapes…’ and the fact of aerial choreography, by seeking to move the set from a state of ground based solidity, through a measured outburst into the space and the air, to a point of disarray. Our most recent touring production ‘Rites of War’, made in collaboration with choreographer Darshan Singh Bhuller had narrative as it’s main driver. ‘Rites of War’s ambition was to play during a period of remembrance as a meaningful, relevant and powerful work that would stimulate thought and debate, evoke empathy and speak of ordinary people in extraordinary situations, joining a growing body of work that responds to wars fought in Iraq and Afghanistan since 9/11. With the aerial work in ‘RoW’ we were very clear that if it didn’t add to or (forgive the pun), heighten the narrative and impact it didn’t go in. We didn’t want to use aerial ‘trickery’ for its own sake, it had to earn its place. In this instance the aerial dance element was used variously to stretch time, play with distance and proximity and at times, shift the audiences perspective of the action upending the dance floor to give a birds eye view of the action. One of the ambitions for ‘RoW’ was to take the piece into alternative venues beyond the scope of our usual theatre touring circuit. The end of the Spring tour saw us mounting the piece in an active military hangar on an airfield as part of a commemoration event and in a church as part of our Autumn tour. In a quest to further engage with new audiences and spaces, we are currently in R&D for a new piece, working title ‘An Ordinary Grief’. Our aims at this stage are to create an intimate aerial dance performance/installation for a ‘non-conventional’ performance venue. Let’s see where this one leads us …..
Running in parallel with its live production work, Gravity & Levity are passionate about instigating, creating and developing quality training events and professional development opportunities created and hosted with our partnership organisations, more of which can be discovered through our EADF and Professional Development pages. Gravity & Levity exists as a project-based company and has a rich history of collaborating with extremely talented and respected artists, producers and technical management, many over several projects and operating under the Artistic Direction of Lindsey Butcher. Extemporary Dance Theatre, Random Dance Co (Brighton Festival), Walker Dance/Park Music, Darshan Singh Bhuller, Charlie Morrissey and Small Wonder, Vincent Dance Theatre, Siobhan Davies Dance Company, The Royal, Royal Danish, English National, Glyndebourne and Slovenian National Opera companies. In 1989, Lindsey joined Ra – Ra Zoo Circus Theatre. Her circus credits to date in various roles as peformer, advisor & choreographer include: No Ordinary Angels, Green Candle & Amici Dance Co’s, Gandini Juggling Project, The Dream Engine, Desperate Men, Caravan Stage, Scarabeus, Momentary Fusion, Tango and Crash, Same Sky, ‘True’ with Fierce, ‘Wallpaper’ with Bedlam and Physical Recall, Fidget Feet, Drapes Aeriens, Stumble Circus, Yes/No’s ‘Lost and Found Orchestra’, ‘Prometheus Awakes’, ‘The Exhibitionists’, Metta Theatre, Upswing and Rogueplay. G&L have no roles to fill at present.